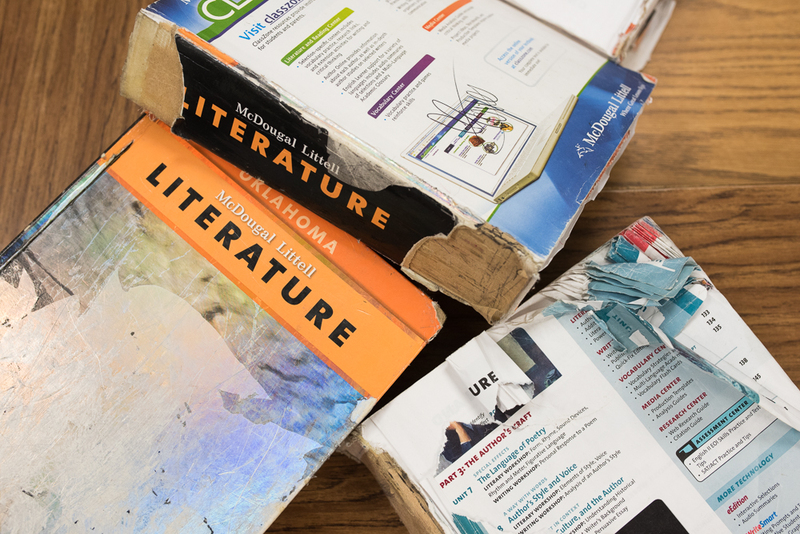 Freshman English books are in need of replacement at Putnam City High School in Oklahoma City. One of the most iconic images of the teacher walkout and the cuts to education funding that drove the movement was of tattered, duct-taped, antiquated textbooks. There was the viral image of an Ada girl holding a class reader that apparently was once assigned to country music star Blake Shelton, now 41. And the photo of a crumbling history book from Owasso in which George W. Bush is the current president (the district later said that particular book wasn’t in use). These images grabbed headlines, likes and retweets, but are not the whole story. There are new textbooks in Oklahoma classrooms. There are also old textbooks in Oklahoma classrooms. Some school districts can more readily invest in new textbooks than others. But statewide, textbooks have become a symbol of teachers’ frustration. A two-year hiatus in textbook funding from the state, in the 2016-17 and 2017-18 school years, led many districts to delay buying new textbooks. While lawmakers said the money was still there, state Superintendent of Public Instruction Joy Hofmeister said the funds were eliminated. “At a time when educators are implementing new, stronger standards for English language arts and mathematics, districts will be scrambling,” she said in a 2016 written statement. Schools typically follow a six-year adoption cycle for new textbook purchases, which is set by the Oklahoma State Textbook Committee, a group of parents, teachers and community members appointed by the governor. The committee reviews all materials and approves the ones that align with state standards. Those titles are placed on a centralized list for districts to use. The committee is reviewing math books and will begin updating language arts and instructional technology later this year. Districts aren’t required to update on the schedule. The state textbook allocation is distributed to districts based on their student counts. The funds can only be spent on textbooks and instructional materials. 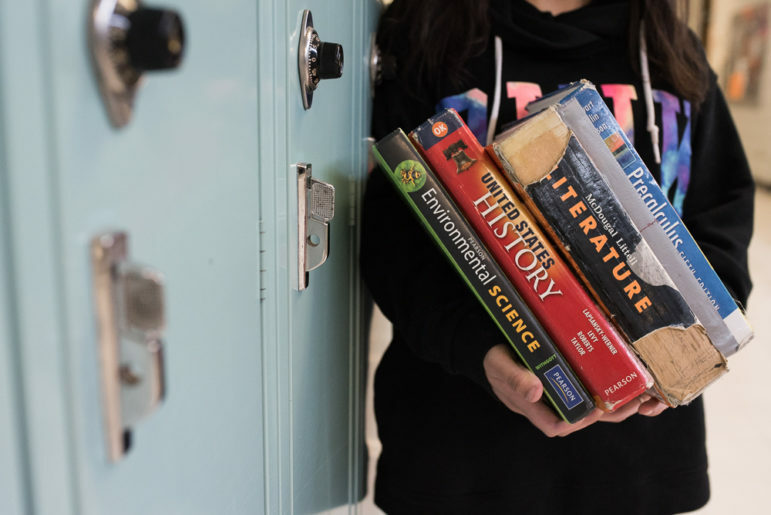 The state has allocated $33 million for textbooks each year since at least 2002, except for the last two years when the line item was “zeroed out,” according to the state Education Department. Lawmakers said the $33 million was simply shifted to the state aid funding formula for fiscal 2017 to give schools more flexibility, but the Education Department’s total appropriations declined slightly that year, by just over $6 million. Overall spending on textbooks dropped significantly in 2016-17, the latest year for which school spending data is available, from $38 million to $22.7 million. But prior to that year, schools received a dedicated $33 million a year to purchase new textbooks and instructional materials. So how can textbooks in the state be in such poor shape? Divide $33 million by the nearly 695,000 public school students in Oklahoma, and it’s an average of $47.50 per student. Textbook costs vary, but most are in the $90 to $100 range. So $33 million is about one new textbook for every other student. Districts can, and do, spend other dollars on textbooks, but their ability to do so varies. For instance, many districts sought local bonds during the two-year hiatus, and district leaders said that helped keep pace with textbook replacements. Of the $22.7 million total spent by schools on textbooks in 2016-17, Tulsa Public Schools accounted for nearly a quarter of that, investing $5.6 million on textbooks that year, compared to $1.2 million the year before. That money came from Tulsa’s 2015 bond, which included $12.5 million for textbooks and materials over six years. That’s $50 per student per year, which still doesn’t buy a new book for every student. “Fifty dollars is not enough, just like the amount the state gives us is not enough for each child for all the content areas, so we work really hard to be really responsible with those funds,” said Danielle Neves, executive director of teaching and learning for Tulsa Public Schools. Tulsa high school student Brianna Davis said she purchased five of her own books this year —one as a graded assignment. Using old textbooks in her advanced classes puts students at a disadvantage. Oklahoma City Public Schools spent less than $79,000 on textbooks in 2016-17 for 45,000 students, down from $4.5 million the year before, state Education Department data shows. Oklahoma City’s 2016 bond didn’t include funds for books. A Putnam City High School student holds textbooks in the school’s hallway. The physical condition of textbooks isn’t the only issue schools have. Oklahoma’s curriculum standards are subject to revisions by the state Department of Education and the state Legislature. And the standards have changed so frequently, it’s difficult to adopt and purchase new textbooks fast enough, educators say. Oklahoma adopted Common Core State Standards in 2010, then repealed them in 2014. Completely new standards were implemented in 2016. So school districts have been making decisions about which textbooks to replace with the standards in flux for many years. Spending on textbooks by Oklahoma schools has varied widely over the past decade. The Legislature appropriated $33 million earmarked for books and instructional materials until 2016-17, when the line-item amount was removed for two years. Districts can purchase textbooks and other books, such as literature, on their own. Figures below are in millions, rounded. Source for data: Oklahoma Cost Accounting System. * In 2016, Superintendent Joy Hofmeister said $33 million in textbook funding was cut by the Legislature for the 2016-17 fiscal/school year. Legislative leaders disputed that, saying the funds were shifted to the state aid funding formula on request of the Oklahoma State School Boards Association, to give schools more flexibility. However, the Legislature trimmed total common-education appropriations for 2016-17, with a net loss of just over $6 million (-0.3 percent). Appropriations rose by 1.4 percent in 2017-18, but the textbook line item wasn’t restored. It is being restored for 2018-19. Guthrie math teacher Shurlyn Maltz said some of the textbooks her students use have covers falling off, but that’s not her main concern. “The structure of them is the minor part. The fact that they don’t contain my standards is the bigger part,” said Maltz, who is also on the state textbook committee. Less than half of the current standards are taught in her textbooks, so she said she supplements with material found online or through worksheets. For veteran teachers, that’s time-consuming but not too difficult. She’s concerned emergency certified teachers would just run through the book chapter by chapter, leaving students ill-prepared for standardized tests. In some districts, teachers are given a classroom set of textbooks instead of one for each student, in order to spread textbook dollars further. 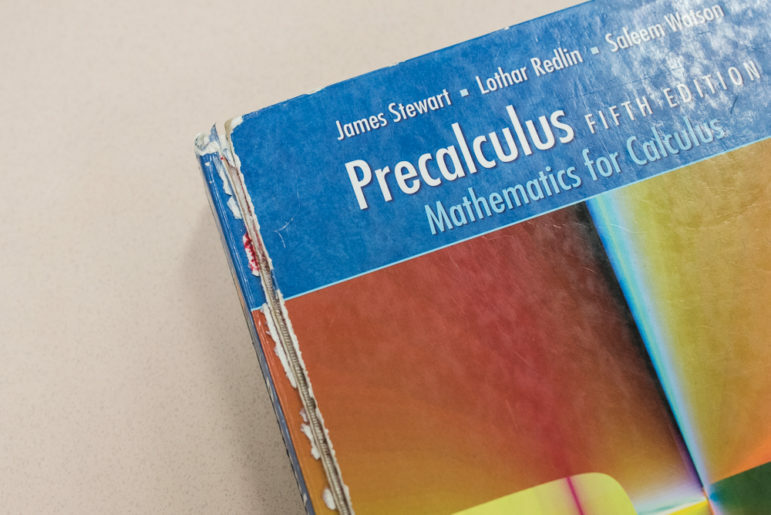 The binding is torn on a precalculus book at Putnam City High School in Oklahoma City. In Tuttle, for instance, an algebra teacher may have a classroom set of 25 books, with 125 students using those books throughout the day, said superintendent Bobby Waitman. That can be a problem for students working on homework. Waitman said a few years ago, his son brought home a textbook to work on an assignment only to find the section he needed was completely torn out, presumably by a student who didn’t want to lose access to the material when they had to leave the books in the classroom. 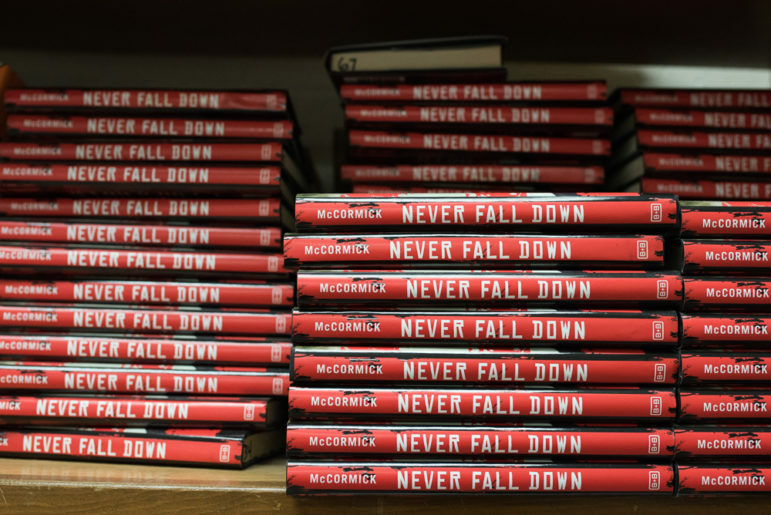 Copies of this novel, about a boy who survived the Cambodian genocide, are stacked in a Putnam City High School classroom. The books reflect how school districts purchase not only textbooks, but works of literature and other books for student learning. Sometimes students are asked to buy the books. One way some school districts are addressing the issues of textbook wear-and-tear and ever-evolving curriculum is through digital textbooks. Tuttle this year moved to digital textbooks and Chromebooks in its middle school. Putnam City, a 19,500-student district, is also transitioning to digital textbooks for middle-school students and several other grades and subjects. The move has been a cost-savings to the district, even with the initial investment of iPads for each student, which was paid for with local bond revenue, said Lindley, the district spokesman. One of the main benefits is their own teachers develop the textbooks. They start with open-source digital content, then create and organize the text, following the guidance of curriculum specialists to align the content with Oklahoma standards. The first year they made the switch, with sixth and seventh grade math, it saved the district more than $200,000 compared to buying new textbooks. Plus, the digital textbooks are reviewed and updated every year. A recent study by researchers at the University of Maryland found students preferred reading on screens and thought they performed better, but their actual performance suffered. Putnam City students, too, overwhelmingly prefer the iPad, though most students still use traditional textbooks. And yes, some of those textbooks have broken spines and ripped pages. Reach Jennifer Palmer at jpalmer@oklahomawatch.org or (405) 325-2084. Oklahoma Watch reporter Whitney Bryen contributed to this report.